Baba G’s and The Gentlemen Baristas will be part of a line-up of traders at a retail space in London Bridge opening next month. 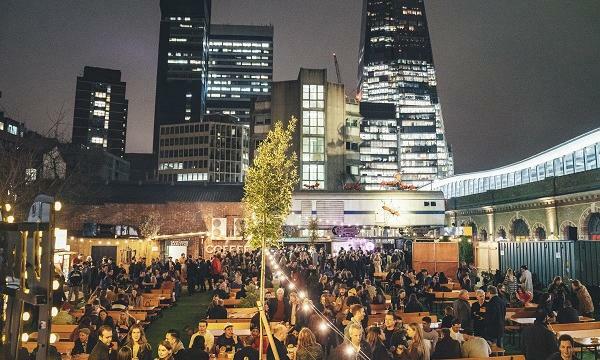 Located on St. Thomas Street near The Shard, Vinegar Yard will feature art installations, container pop-up shops, bars, street food traders and a open air garden area with outdoor seating for hundreds of people. Officially opening on April 3, Vinegar Yard will also offer an open-air bar serving cold draught beer and a rotating tap for local London craft breweries. Weekend guests can also shop at Flea London, a curated vintage and makers market that will pop up in Vinegar Yard each week. The market will sell vintage clothing, homeware, books, ceramics, cameras and others. Featuring a collection of repurposed art and design, the site has been curated and designed by Benj Scrimgeour, founder of Flat Iron Square; with installations created by Joe Rush of Mutoid Waste fame. Visitors to Vinegar Yard will be able to view Rush’s live onsite workshop, where his team of artists will work on ‘Stories from the Wasteland’ - an apocalyptic mechanical sculpture project that will be displayed around the site in the coming weeks.